In 2003, with my parents in tow, my first impression of Byron Bay wasn’t overly inspiring. Overwhelmed by a general feeling of grubbiness and surrounded by stumbling, drunk gap year students I couldn’t wait to leave for the glam Gold Coast. So, when I decided to move to Australia in 2017, Byron Bay wasn’t at the top of my list of places to visit. But that all changed when I heard that I might have the chance to spot a Hemsworth (sadly the closest I got was a sighting of Chris Hemsworth’s ex-girlfriend). Fast forward to 2018 and my second visit to Byron Bay and I fall in love. Byron has transformed into a hippie-chic destination for wealthy Sydneysiders and budget travelers alike. The variety of cuisine, fashion, activities, beaches and quirky personalities has made Byron Bay and the surrounding Shire one of my favorite holiday spots. Due to the popularity of Byron town there have been some amazing developments throughout Byron Shire that I would highly recommend checking out if you’re visiting. I truly believe there is something for everyone; from vegan restaurants, natural healing lakes, bush walking, music festivals, farm stays, luxury resorts and a giant amethyst cave…what more could you want? Byron itself can be very pricey so if you are on a budget then look no further than Byron Bay YHA Hostel/Backpackers, where you will meet likeminded travelers whilst staying moments from the famed main beach. If camping is more of your thing, then check out Retropod Vintage Caravan–that gives you the option to camp in retro style in Byron, Lennox Heads or Brunswick Heads. On my most recent trip to Byron, I found most of the accommodation was booked up and ended up staying in the delightful inland town of Mullumbimby (more on this later) where there are many Airbnb options including this fabulous Gypsy Wagon. If you’re feeling fancy then I’d recommend The Byron at Byron Resort & Spa and you’ll be bathed in luxury and have the chance to indulge at the hotel’s spa. The Atlantic is ideal for honeymooners or those on a romantic escape, with original Byron Bay cottages transformed into quirky but luxurious rooms you may never want to leave. But hopefully what follows will inspire you to explore! Byron is a beach town with all of the beachy activities you’d expect, so I don’t need to tell you about the swimming or great surf (especially as I am most certainly not an authority on what constitutes ‘good surf’). What I’ll tell you about are the activities I think you’ll enjoy when you’re fed up of having sand everywhere. The Lighthouse walk at sunset is a popular attraction for a reason, it is worth doing for the stunning skies and crowd of totally zen people enjoying the vibes. At Cape Byron you’ll also have the chance to get a great insta-worthy pic at the easternmost point of mainland Australia. Last time I was there I spotted a very chilled out python nestled in the bushes, so you may get a taste of the aussie wildlife too. If you love to hike and want more of a challenge, then the Mount Warning Hike (at dawn) is about an hours drive from Byron, it is tough but rewarding and made me feel like I had stumbled through a time machine to a time before civilization. One of my favorite places in the Byron Shire is The Farm where you can take a tour, learn about sustainable farming methods, have delicious brunch, BBQ or dinner, stroll beside the 6 ft tall sunflowers and wander through the trees collecting your own pecan and macadamia nuts. It is kid friendly as well so there is fun to be had by all! Plus they have fresh ice cream, so it’d be rude not to. Personally, I’m a fan of all things ‘Woo Woo’ so when I found out about a place called Crystal Castle, I had to go. I’ve since been twice more and I always spend a little too much money in the crystal shop (oops). It is family friendly and contains within the gardens: the world’s tallest geodes, an amethyst cave which you can mediate in daily, the only Buddist Kalachakra World Peace Stupa in the southern hemisphere, a café with delicious food, glorious views and much more. Plus there are a lot of Instagram worthy photo opportunities if that’s your thing. After all these activities, you might want the chance to rest and recharge. For this, I recommend Lake Ainsworth, more commonly known in the area as ‘Tea Tree Lake’. It is an amazing copper colored fresh water lake, located in Lennox Head which is about a 25 minutes drive south of Byron. The healing properties will leave you feeling fresh and revitalized and can potentially help with skin conditions (including sunburn). The lake is separated from the sea by a thin spit of land so you can run between the two if you wish, although the lake is so relaxing I never made it across to the sea. All those years ago, there was one thing that saved Byron from my complete disregard and that was a veggie lentil pie that ruined me for all other pies. Sadly, I didn’t find the pie shop upon my return but I definitely found some gems that would tempt me back anytime. The first was Miss Margarita, a lively Mexican joint mere moments from the main beach with great Margaritas and an even better atmosphere. If you’d like something vegan then head to Pure melt chocolate either in Byron or Mullumbimby; they have wonderful vegan sweets and vegan burger night twice a week. If you’re wanting something a little special then head to Mavis’s Kitchen and Cabins set in a dairy farm at the base of Mount Warning for a fabulous Brunch (ideal if you’re planning on doing the hike). Surrounded by World Heritage rainforest they also offer delicious hampers that you can enjoy on the property. Another farm I’ve mentioned before (The Farm) has a restaurant call Three Blue Ducks that serves breakfast, lunch and dinner. Even if spending the day at The Farm isn’t your thing then this restaurant is pretty legendary. In my opinion eating food produced locally and sustainably makes it that much more tasty! Another spot with vegan and veggie options is also in Mullumbimby, namely Paddock Project. I personally haven’t been here but a friend who lives in the area assures me that I have missed out. If you’re self catering you can also buy produce boxes full of organic local veggies. With all of the fabulous outdoor activities on offer in Bryon Shire, you can also head to Byron or Mullumbimby Farmers Markets to stock up on local delicacies and hopefully taste some freebies. Byron Bay can get very busy so if you’re looking for a more understated and chilled out hippy vibe then head inland to Mullumbimby. Here you’ll find some of the lovely recommendations I’ve mentioned above. 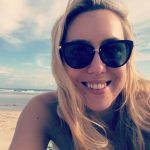 You can also day trip to Brunswick Heads which is quiet, family friendly and boast impressive craft boutiques and has some fun vintage/curiosity shops (a whole rack of vintage dungarees anyone?). There is a hugely popular music festival called Splendour in the Grass held every July close to Byron Bay, you’ll be lucky to get tickets but if you’re going to be in Byron at that time of year its worth a try! There is also Bluesfest, the foremost destination festival in Australia which will be celebrating its 30th year in 2019 on Easter weekend. I hope you’ll check out Byron Bay and its surrounds. Happy travels!